Adele is Queen of the Brits, winning four prizes including best British female solo artist and best album. "To come back after so long away and be so warmly received means so much," she said. The star, who closed the show by performing When We Were Young, also received best British single and the Global Success award. The show also featured an emotional tribute to David Bowie, led by Annie Lennox and his friend Gary Oldman. Lennox called Bowie, who died of cancer last month, "a quintessential visionary" and "the ultimate iconoclast." Oldman then accepted a Brits icon award on behalf of the singer and his family. "David you were mortal, but your potential was superhuman," he said, "and your music lives on". Bowie's band then performed a medley of his hits, before New Zealand singer Lorde joined them to sing Life On Mars. The tribute won positive reviews from fans and critics. Bowie's film director son Duncan Jones also approved. The ceremony was opened by Coldplay, who gave a colourful, floral performance of their single Hymn For The Weekend, showering the audience with confetti petals as they played on one of two separate stages at London's O2 arena. They went on to win best British group - making them the most successful band in the ceremony's history. Chris Martin and co now have nine trophies to their name, although the figure pales in comparison to Robbie Williams' 17 awards (12 as a solo artist and five with Take That). Other awards went to James Bay, for best male, and Australian psych-rock band Tame Impala, who picked up best international group. Canadian singer Justin Bieber, who performed his chart topping singles Love Yourself and Sorry, won best international male. "Man, I'm shaking right now," he said as he took the stage, thanking his fans for their support after a couple of years where he appeared to go off the rails. "Life is a journey," he said. "Everyone has their ups and downs." One Direction, who are officially on hiatus, also picked up best video for the space-themed Drag Me Down. "We've been away for a little while, so it's been a bit like getting back on a bike tonight," said singer Liam Payne. One Direction's victory in the fan-voted best video category robbed Adele of the opportunity to become the most-garlanded artist in a single Brits ceremony. As it stands, her total of four awards is equalled only by Blur, who won the same number in 1995 for their album Parklife. 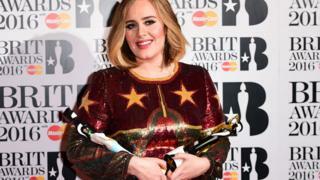 Adele became more emotional as the ceremony continued, bursting into tears after accepting the global success prize - which recognises success overseas. "I got really lost for a while and I didn't know if I'd ever come back," she said, referencing the writer's block that delayed her much-anticipated third album. "For you all to be so kind to me is so nice." Earlier, the star used her best female victory speech to declare support for US pop star Kesha, who has accused record producer Dr Luke of sexual and emotional abuse. Reflecting on her victory backstage, Adele told reporters: "I feel a bit worn out, emotionally. But it was absolutely incredible. I was hoping to win one but to get that many was amazing and very lovely. A nice return." The ceremony, at London's O2 Arena, was broadcast live on ITV. You can also read live updates on the BBC News Website. Video Are the Brit Awards lacking diversity?